The A7000 known as the best budget smartphone did quite well in the market. It is the first to have Dolby Atmos sound feature on the smartphone. The phone comes with a huge RAM and a big screen for watching videos. It is the perfect phone for college students and other people who are looking for an amazingly low budget Android smartphone. Here is a detailed review of the phone. 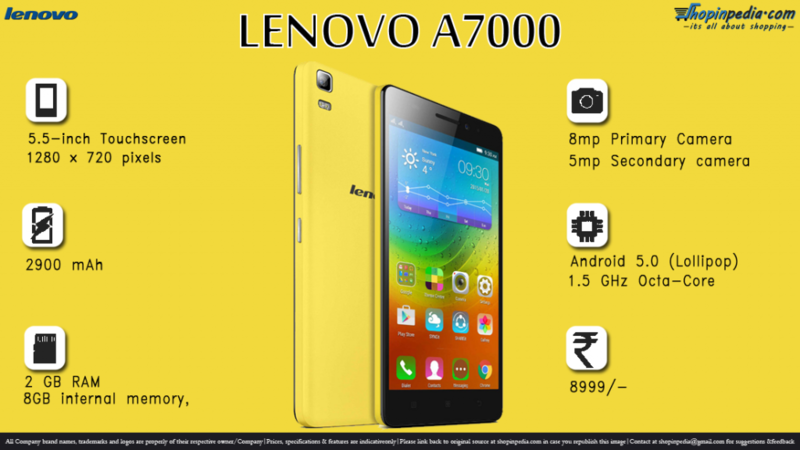 Lenovo A7000 has given a healthy competition to the sony mobiles Xperia Z5, Zperia Ultra and Z3. Where Z3 is a great z series phone with almost same features and it is a good alternative for this mobile. Despite being a large phone, it is quite light in weight which is only of 140 grams. The plastic body is flat on the back makes it a bit difficult to hold. The screen has a lot of bezel on it that you can easily expect from a budget phone. The bottom of the screen is lined with the three capacitive touch buttons. It has 5.5-inch IPS capacitive touchscreen with a display resolution of 720x1280 pixels and density of 267 ppi. The screen is good for a budget phone with high-contrast and realistic colors. Moreover, the big screen is perfect for watching movies and playing games. It has a MediaTek MT6752m processor with an Octa Core 1.53 GHz CPU. It has a Mali-T760MP2 GPU, which gives an excellent and snappy performance. It comes with Android Lollipop, Lenovo Vibe skin, and a 2 GB RAM. It provides 8 GB of internal memory which is expandable up to 32GB through a dedicated slot. The primary camera on the phone is of 8 MP with a f/2.2 sensor. It has autofocus and dual LED flash feature, but there is nothing fancy about it. It captures photos that are fine but not great. The secondary camera is of 5 MP that takes decent selfies and is good for Skype and video calling. With a 2900 mAh battery, you get a 3G standby time of 263 hours and a talk time of 16 hours. Despite the big screen, the internals of the phone aren’t power hungry, and you will be able to get at least 2 days’ worth of power from the phone. Connectivity includes Wi-Fi, Bluetooth, GPS, and radio. 1) The phone has a big battery that can last 2 days with normal usage. 2) The internals of the phone aren’t that great either, and you can expect lagging performance after some time.